Fury Water Adventures will offer special sunset sails on February 14, 2013. To celebrate Valentine’s Day, Fury Water Adventures will offer three different ways to enjoy a romantic evening out at sea. “There’s nothing more romantic than witnessing a Key West sunset out on the water. Our sunset sails are the perfect way to celebrate Valentine’s Day with that special someone and we’re offering three different cruises for our guests”, said Scott Saunders, President of Fury Water Adventures. The Champagne Sunset Sail departs at 5:30 pm on Thursday, February 14th. Fury’s spacious catamaran will transport guests to the ideal spot to watch the sunset. Complimentary beer, wine, soda, champagne and strawberries will be served. Check in is at the Fury Surf Shack at the Westin Marina at 5pm. Fury’s popular Commotion on the Ocean Live Music Key West Sunset Sail features well-known musician Cory Heydon. Guests can dance the night away as they are treated to a concert at sea while they sail into the world famous Key West sunset. Complimentary appetizers, margaritas, beer, wine, soda, champagne and strawberries will be served. The trip departs at 5:30 with check in at the corner of Greene Street and Elizabeth Street at 5:00pm. The Glass Bottom Boat Sunset Cruise is more than a sunset event, as guests get a chance to view the wonders of the coral reef from the comfort of Fury’s Glass Bottom Boat. The boat has a large deck and an air-conditioned viewing room with ample seating so everyone on board can see the many species of fish and marine life that live on and around the reef. Then, as the sun begins its descent, guests can relax on deck with complimentary champagne, strawberries, light snacks and sodas. The Glass Bottom Boat Sunset Cruise departs at 4:30pm with check-in at 4:00pm at 2 Duval Street. Also available: Pair the Valentine’s Day Sunset Cruise with a parasailing adventure. Call one of the Fury reservations specialists at 1-877-994-8898 and ask for the “Love is in the Air” Package. Guests can’t go wrong with any of the options because they’re guaranteed to be some of the most romantic things to do in Key West for Valentine’s Day. Fury Water Adventures also offers a variety of getaways including Key West Snorkeling adventures, hotel accommodations, and water sports. 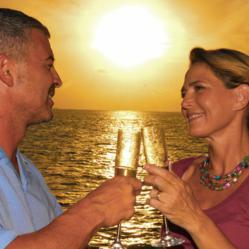 To get more information on packages or to book any of the Valentine’s Day Sunset Sails, visit http://www.furycat.com. Fury Water Adventures has been providing an array of water sports and excursions to guests for more than twenty years. As the largest water sports company in South Florida, they are known for their state-of-the-art fleet of boats, experienced captains and crew and the superior quality of their trips. Fury offers a variety of special trips including their day-long Ultimate Adventure, morning and afternoon snorkel trips, sunset cruises, parasailing, glass bottom boat trips and more. They also offer a variety of packages and special events throughout the year.